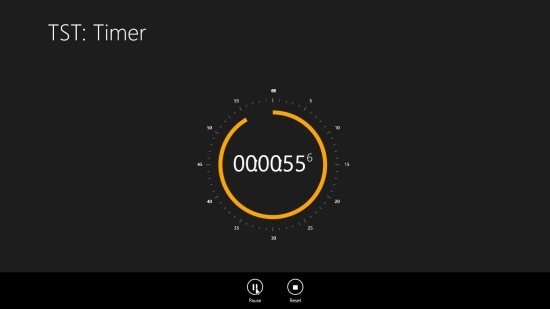 TST: Timer is a free Windows 8 Timer app that lets you count the time duration for any event. It’s a simple and easy to use app with a clean and pleasing interface that supports counting times in hours, minutes, seconds, and milliseconds. The app consists of a beautiful timer, that keeps ticking until you pause or stop it. The app can be used to keep count of the time taken during certain activity or event which is occurring in present. TST: Timer is a free app that can be downloaded using the link given at the end of this post. You can also search for the app in the Productivity category Windows Store using Win + Q key combination. 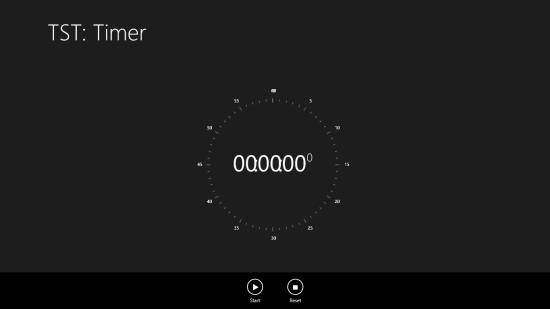 Let’s see how this free Windows 8 timer app works. As I said in the beginning, TST: Timer is quite simple and easy to operate. When you launch the app you will see a big timer clock on the main screen of the app, with two options Start and Reset at the bottom. Click on Start to start the timer. As soon as you start the timer, the Start button turns to Pause. Use this button to pause the timer anytime in between. Once the event is finished, you can click the Reset button to stop the current count and reset the timer again. The clock will show colorful circles being drawn at the inner edge of its boundary, as a sign of millisecond, second, minute, and hour completion. This makes the timer look very exciting. The app also works in snap mode. 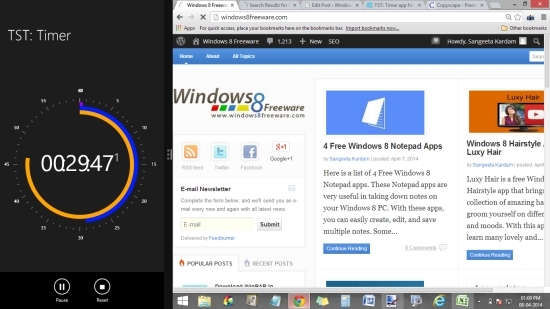 This is all about this free Windows 8 Timer app. Let’s have a quick look at its key features. Also try Jack of Time and Orzeszek Timer Countdown. TST: Timer is a nice free Windows 8 Timer app for tracking time taken by certain events. The snap mode feature makes it extremely useful in counting the time spend on various activities while working on Windows 8 PC. Give it a try and share your feedbacks via comments.